Paint is the bomb. It has taken our den from night to day. It feels more inviting, cozy, and MUCH brighter. Let’s go back to the beginning for a nice, dramatic before and after. 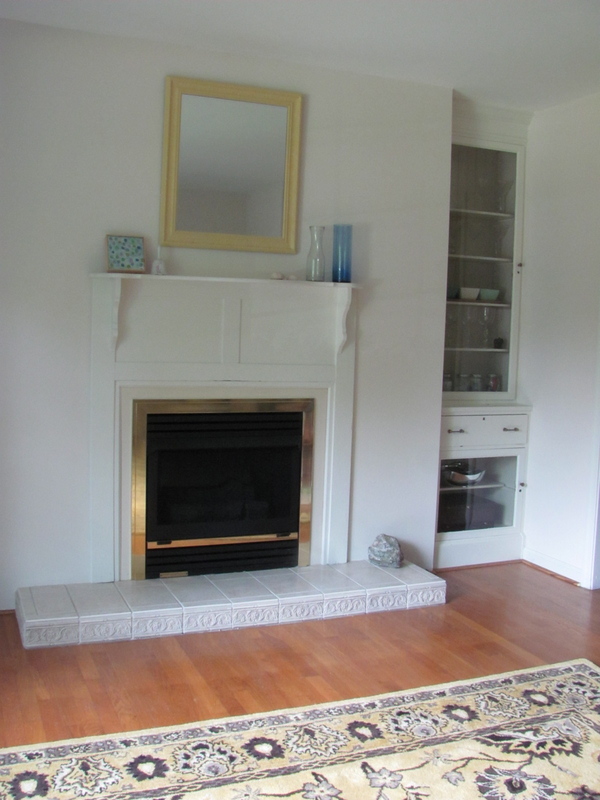 Here’s what the fireplace and den looked like before the sellers moved out and we moved in. 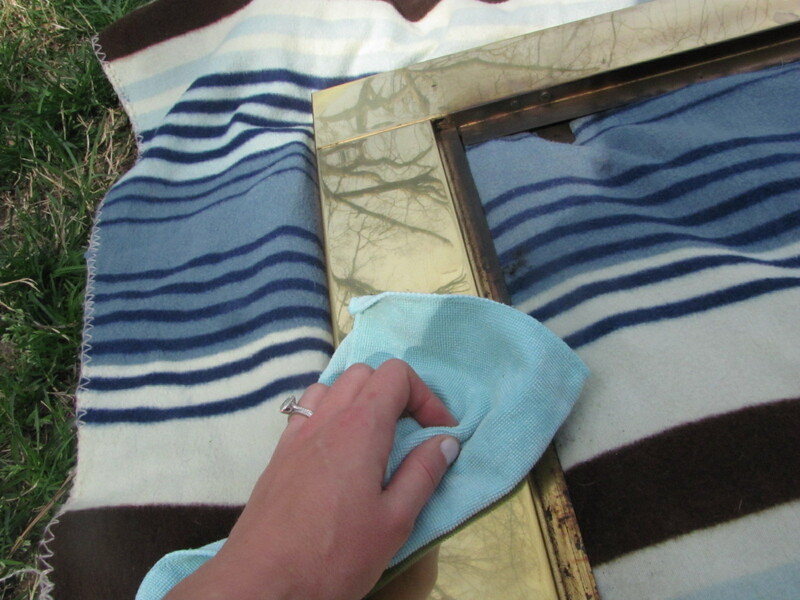 The first thing I did to update the space was spray paint the fireplace cover to get rid of the gold. 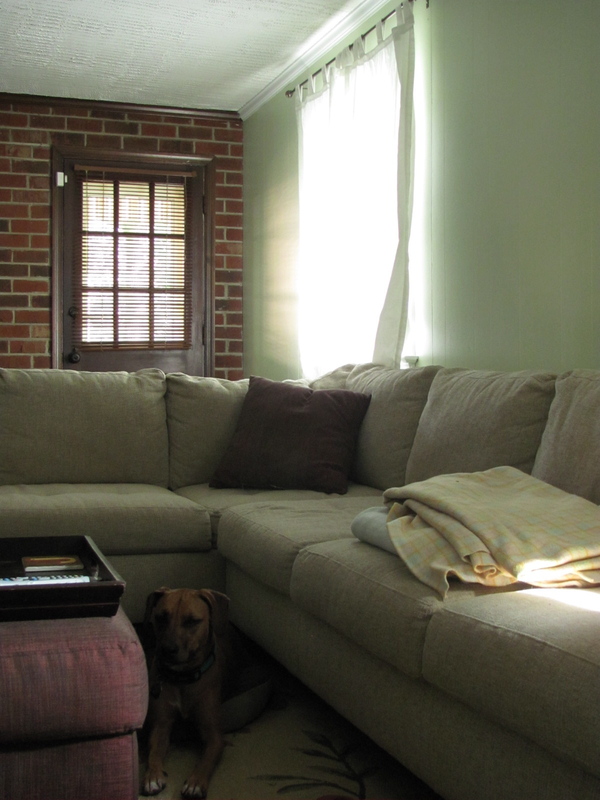 Then we painted the paneling a green which gave the room a big boost of light. Our most recent step was to paint the massive brick wall. We started off by vacuuming the brick to remove any dirt and dust. Then we primed it with two coats of Multi Purpose Latex Primer from Valspar. Followed by two coats of eggshell white latex paint. 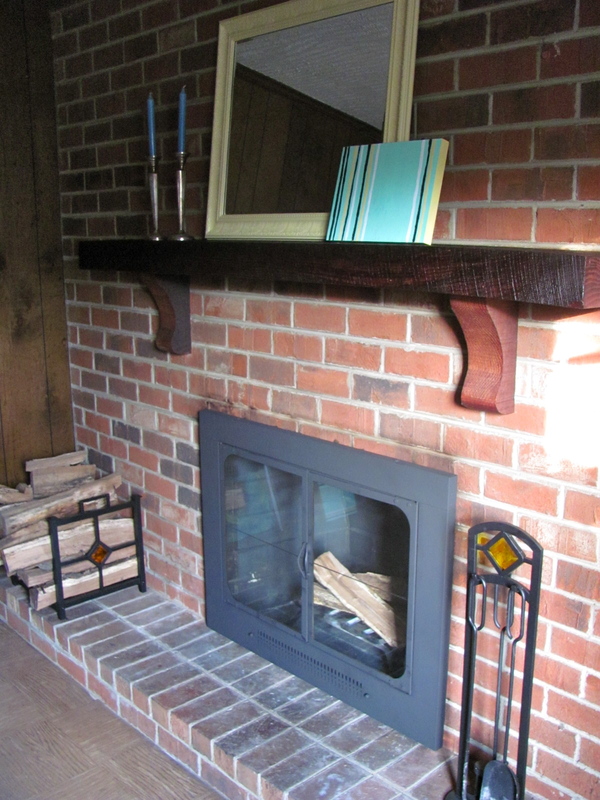 Al also used caulking to fill in the many gaps and holes between the brick, paneling, and trim. Oh and after we realized the soot around the edge of the fireplace was bleeding through, we painted over those spots with some Valspar High Hiding Primer. Then the fireplace was complete! I have proof that I did other stuff though! You’ll see it all in the next week or so. P.S. I know I have the same exact mirror on the other fireplace right now. I just love them! Last year I found the pair at Marshalls for $12 each then spray painted them yellow. 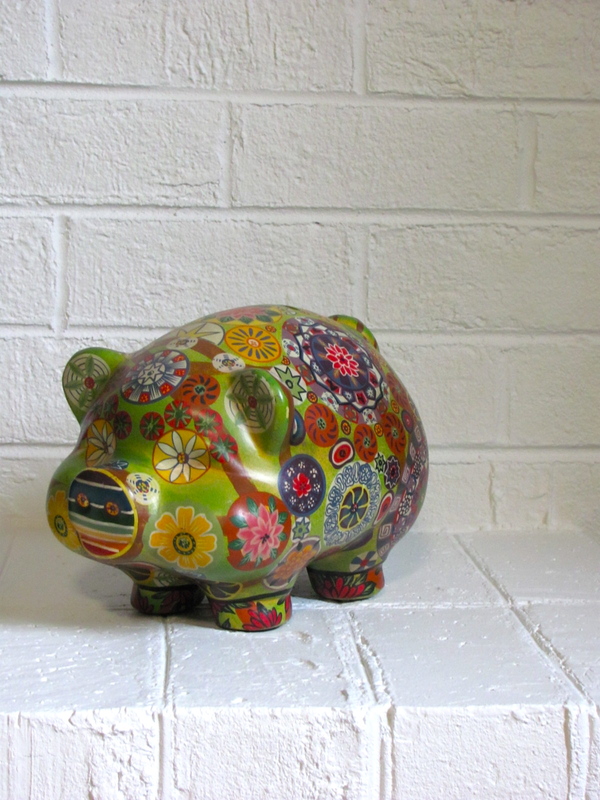 This little piggy bank is the cutest. The bright colors are awesome. I hope to bring some of them up onto the mantel to balance it out. Now all we have to do in this room is paint the door (I’m thinking a fun color) AND put down bamboo flooring. <- only the biggest job we will attempt yet. Sheesh. This reno stuff is tiring but now that we see some major progress we’re feeling the motivation. Al is super proud of his fancy white fireplace and I am too! Did you enter the giveaway yet? You should! I wanted to get a good amount of projects done over this long weekend and we sure did. We worked on the mailbox, vegetable garden, decor and lighting but what I didn’t do was paint the big wall o’ brick in the den. Instead I avoided it and moved onto our other fireplace in the living room. 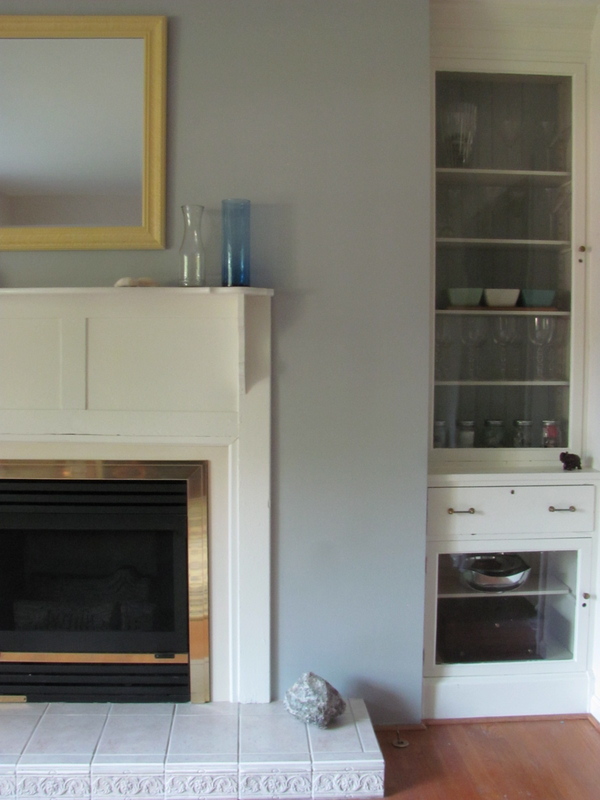 I’ve got to tell a little back story of the fireplace and built-ins because I think the previous owner would be excited. The shelving you see in the photo below are antique display cases from a beauty salon (early 1900s) and the mantel is also antique although I don’t know where it’s from. The lady’s husband told me she just found those pieces and built out the entire fireplace herself! Maybe she had help but from the looks of her elaborate greenhouse, I’d like to believe she did it alone. Super impressive. I do appreciate the backstory but I thought the look needed an upgrade. A little paint perhaps? I decided to paint the surrounding wall of the fireplace as well as the back of the shelving to give the fireplace and all my glassware a little boost. 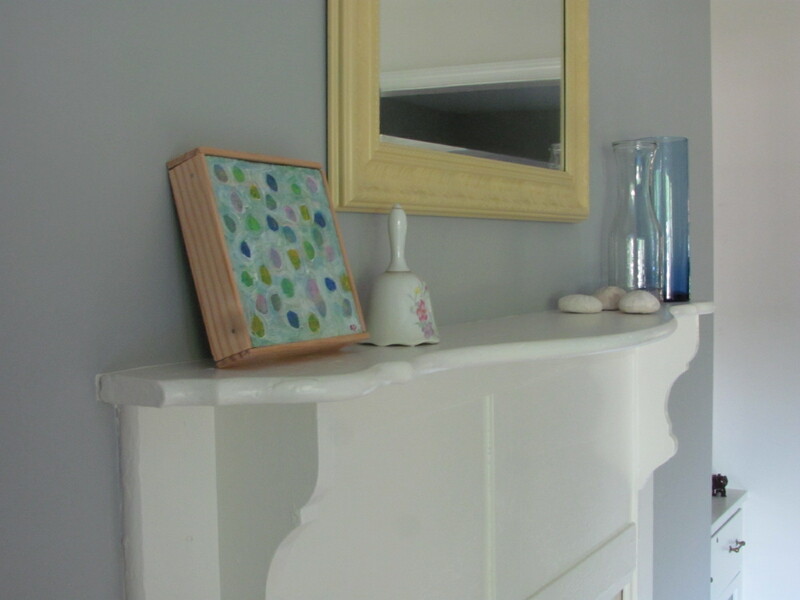 I had a can of gray/blue paint so I went for it… at three o’clock this afternoon. I had a strong desire to get just oooone last project in! The sun was setting so it’s tough to see the gray behind the shelves but with a little help from my sister I got this baby done in just a few hours. I love the contrast of the crisp white and gray. I already feel like the gray has always been there. It just fits so well! Do you see that big rock on the fireplace? I found it on a trip to a rock quarry in NJ when I was in middle school. I flew with it on the plane back home to FL. BTW it’s SUPER heavy. Ha. I may or may not still have a rock collection somewhere in this house. Back to the main topic. 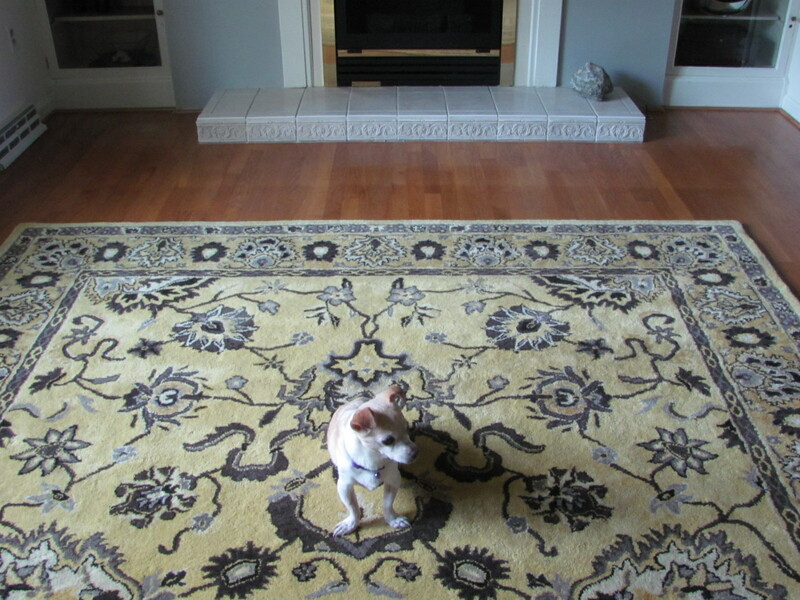 You can see a similar gray in the carpet. Matchy but not too matchy. My things would get lost in our house before when there wasn’t any personality but now they shine – one of my paintings, a bell from my grandma’s collection, sand dollars fossils from Lily Lake (FL), and a tiny brown elephant I got from the grab bag one Christmas in NJ. Did you tackle any projects this weekend? Or did you soak up some sun instead? It was a beautiful weekend! 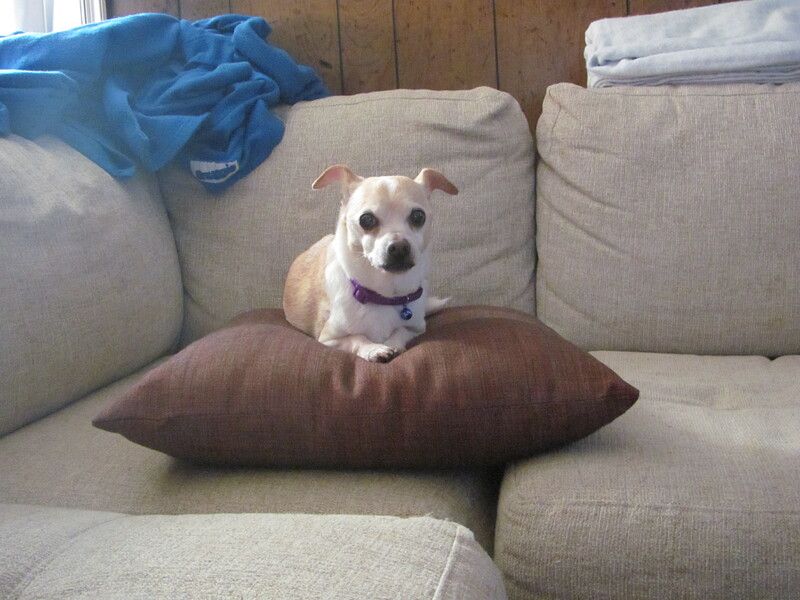 I took the following photo of our den when we were first house hunting. 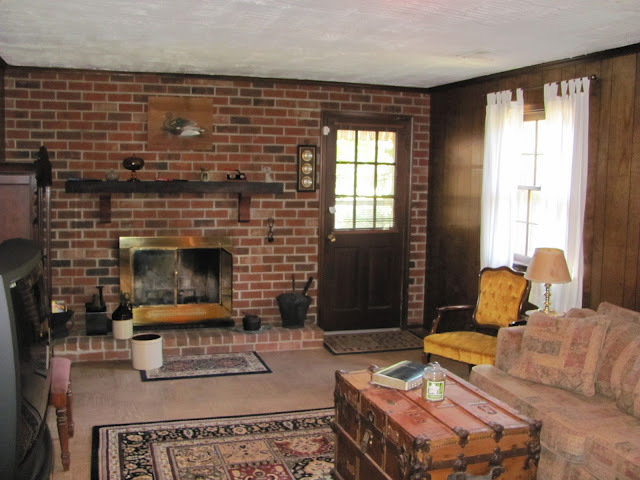 Notice the gold fireplace, brown brick, paneled brown walls, and wood grain (?) tiled brown floor. 1970 as I live and breathe. We’ll be tackling this room project by project. Course it’ll probably be sporadic since I already went from the master bathroom window to the den but it’ll all get done in time! Shall we begin? I decided to start on the easiest thing first which was the fireplace cover. 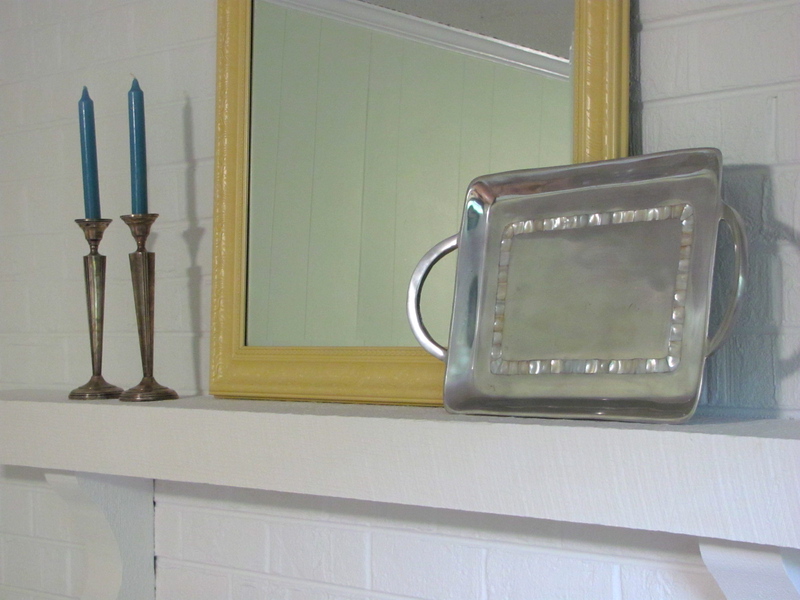 I like gold in jewelry form but definitely not on my fireplace. To keep the project ‘green’ I painted the existing cover instead of buying a brand new one. I used this paint from Lowe’s that withstands high heat. 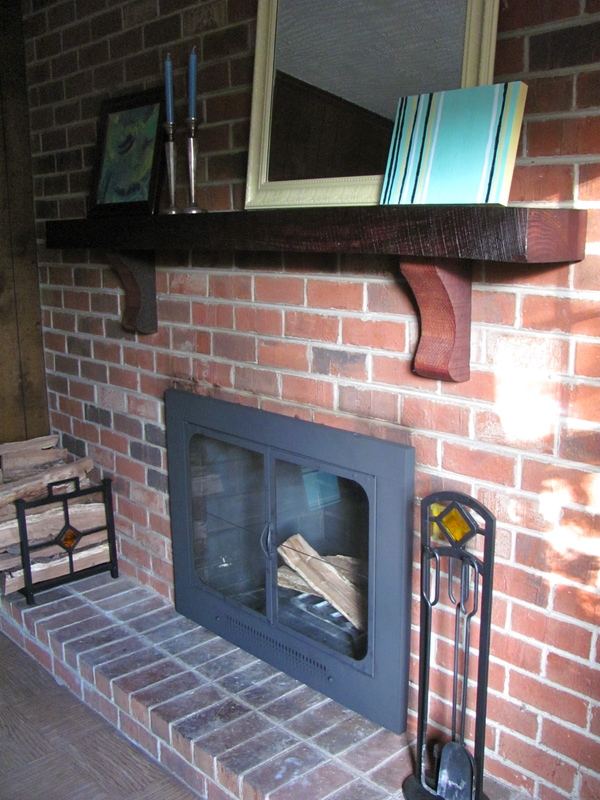 We have black fireplace accessories so that’s the color I went with to tie it all together. To start I took the cover outside and detached the doors from the frame. 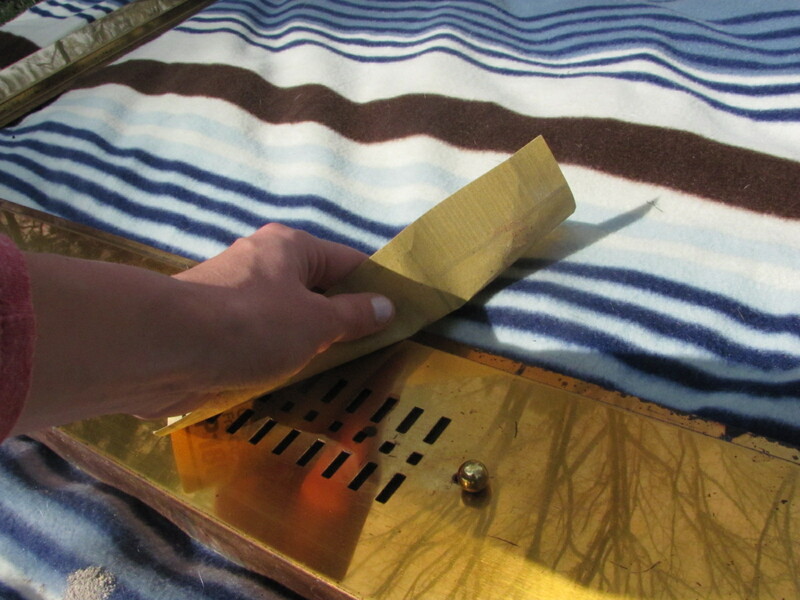 Then, per the instructions on the can, I sanded any rough spots with a fine sandpaper first. I used this ugly blanket because I didn’t want to get the drop cloth, a material that is supposed to be used to catch paint drippings, dirty. My husband was confused and you probably are too. The next step was cleaning off all the dirt and debris. I used my homemade all-purpose cleaner which worked fine. 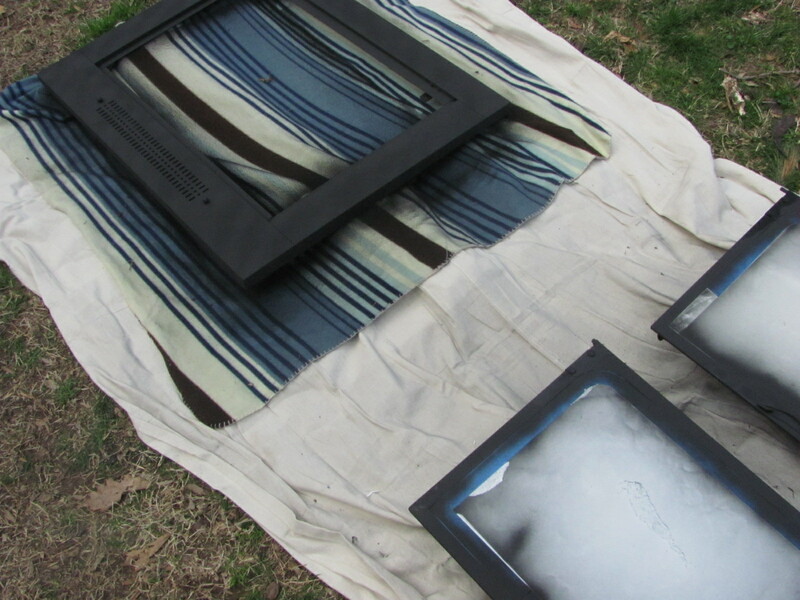 I then started on the spray painting. 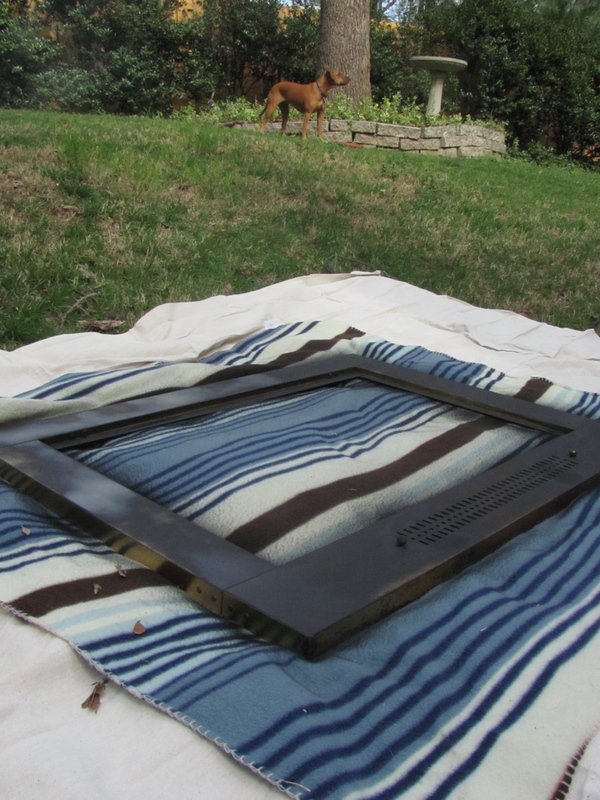 After the first coat of paint, I had the great idea of putting some of those garden stones in the background of the next photo underneath the blanket to elevate the cover. 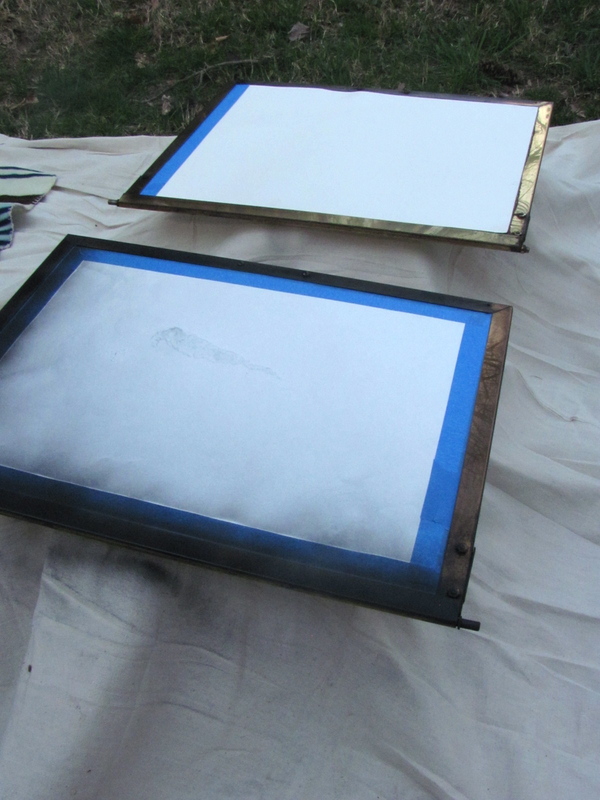 It saved me some time since I was able to spray paint the sides as well as the front. I did the same thing with the doors using flower pots that I have yet to plant anything in. 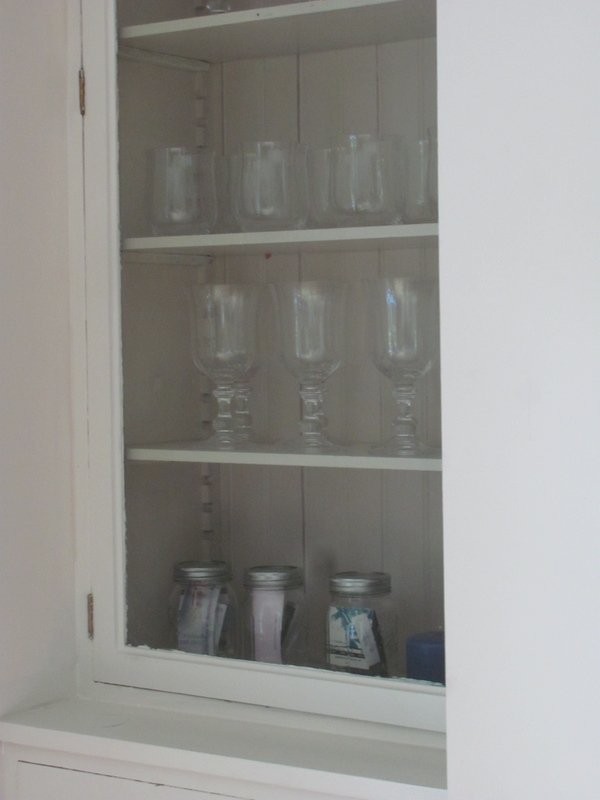 I protected the glass on the doors with paper I had laying around and painter’s tape. The front side of the doors were a little tricky because of the curved edges. 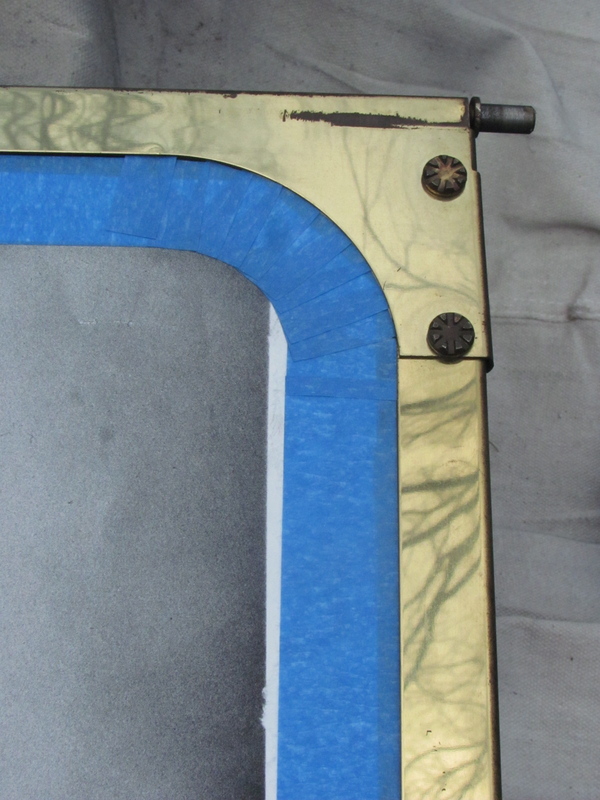 I cut up small slivers of the tape and curved them along the gold. I did two coats of paint and finished off the can. I think I’ll need to add one more coat to smooth out the look. It’s a little blotchy due to my spraying ability the windy conditions. Joking aside, it was a bit windy so I should have moved my project to the carport to help make the spay more consistent. Alas, I did not. 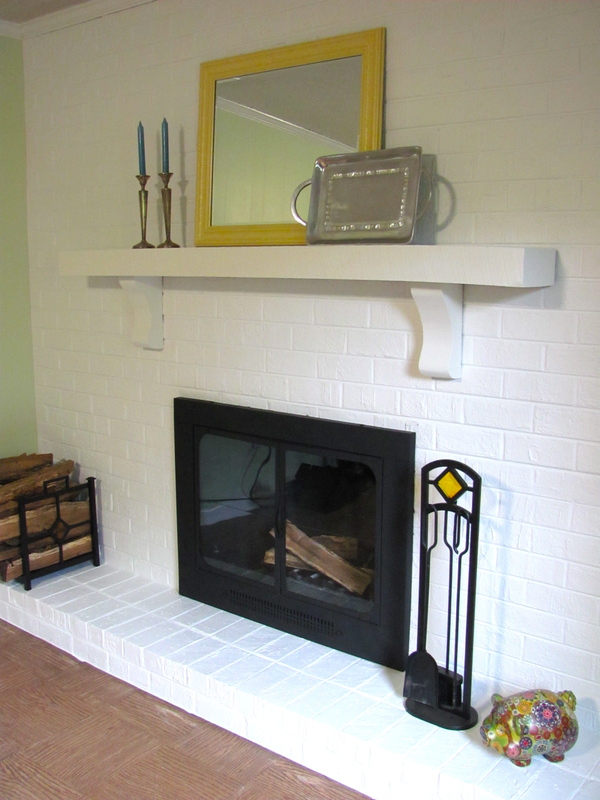 If you can tell from the next photo, the ‘black’ of the fireplace cover is much different than the ‘black’ of the fireplace accessories. I’m not sure if it’s because of the matte finish or what. When I head back to Lowe’s for another paint can I might see if there are any other options that would help with this issue. Maybe I need a glossier finish. Next it’s on to all those brown elements. We’ve got a lot of painting to do!! Oh and this lady is still around! She’s still screaming up a storm when we leave the house but I THINK she’s getting better. She wags her tail once in a while and is getting used to us and our routine. Pretty darn cute. That’s a cat bell collar she’s got on, it really helps to know where she is! Ha. 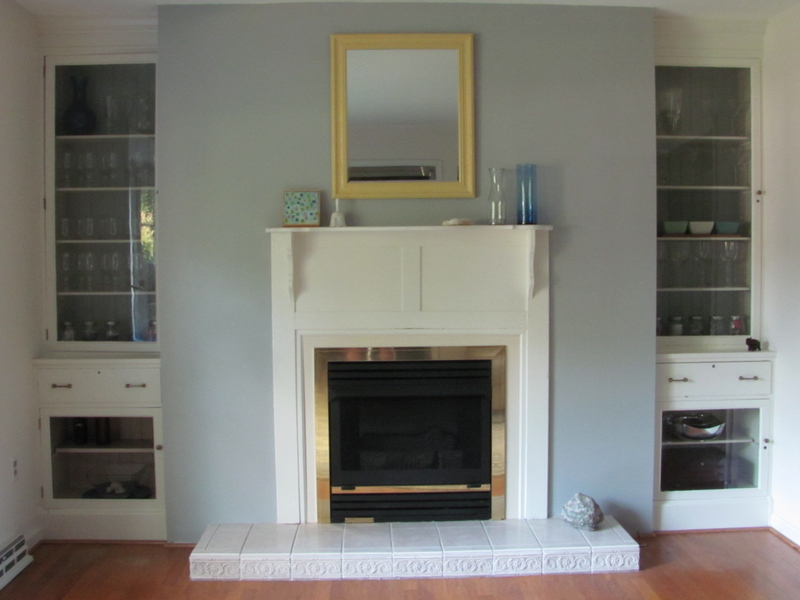 Have you painted a fireplace before? What color did you use?? I’m thinking white for ours.